Ever since Gallery Neptune moved to its fantastic new premises in the PeriPoint building on Wilson Lane, the old building has remained unoccupied. Peering through the window the space is bare, while outside – other than the remains of a twisted metal fence, a plant pot and an empty bottle of beer – is a development application dating back to 2007 and a large artists impression of the future development. The prospective development looks like an exciting and would certainly be a great addition to this corner of Old Bethesda. But does anyone have any further information about which stage of the development process this building is in? 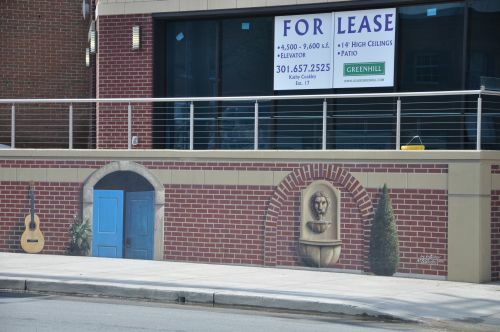 New Bethesda mural completed! But what about the building? The latest wander past the new Bethesda mural has found it completed and looking pretty good. Unfortunately a photo of the entire wall was made impossible by guy who – given the choice of the entire road – had decided to park his truck right in this spot. But imagine a mirror placed vertically down the center of the door (minus the guitar of course) and you pretty much get the picture – literally! 1). Who designed the mural and painted it on the wall? 2). Does anyone have any information on the building that’s up for lease? Here is it being painted, along with some info on the awesome Bethesda Train! 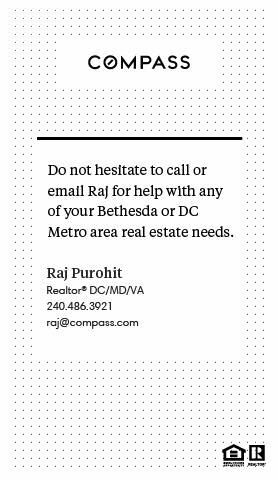 As part of our regular review of the Bethesda real estate scene we want to make sure that we give you a flavor of the options, opportunities and challenges facing folks who want to rent an apartment in the community. 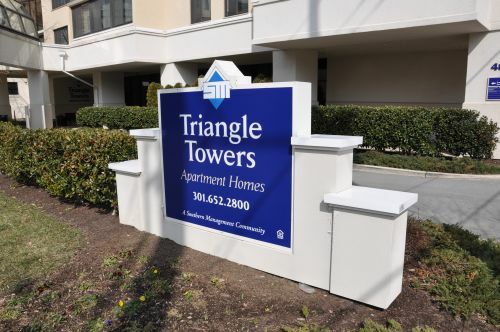 Today I wanted to showcase a terrific building on Cordell Ave called Triangle Towers. The apartment complex is run by Southern Management and there is a lot to like about the place. For starters the staff are friendly and keen to be of assistance — always a plus point in apartment or condo buildings. The building has a 24 hour front desk person and has a charming lobby and entrance way. Residents can get access to a community room on the first floor and there is a gym available as well. The roof top has a small pool (not really lap worthy) and a sun deck. Let us know what you think of Triangle Towers and if you find this feature useful. 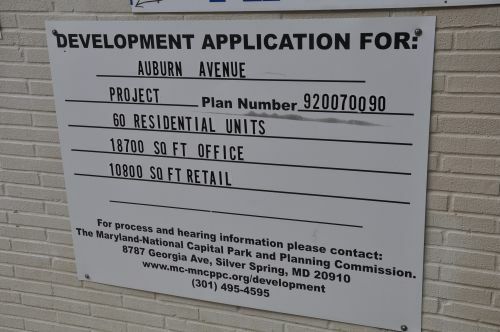 Noticed this development application on the wall of the Huntington Learning Center and Bethesda Radio building, for 60 residential units plus office and retail space. No dates are specified. 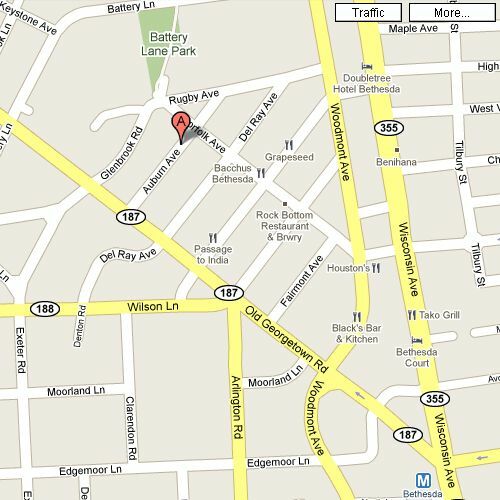 The address is in Old Bethesda, on 4921 Auburn Avenue (below). Does anyone know what is going on with this potential development? Establishing trends in local real estate is never easy and our community is no exception — I have found myself looking through the classified section and being surprised both by the bargains on offer and also by the high prices being asked (and received) for purchases and rentals. So I thought it would be interesting to begin a regular feature on real estate in the area. We’ll try to bring a wide range of listings (to rent or buy) and showcase a few properties each week. Naturally, we encourage you to share your opinion in the comments section — do you think a particular house for sale or an apartment for rent is priced right (but you must be nice as these are peoples homes!)? Of course there is no right or wrong answer and we hope that by putting some listings out there we can help people to sell/ rent/ buy more easily. SFH, Bethesda, near NIH and Walt Whitman HS$2400, Bethesda SFH, for rent by owner: single level w/ full bsmnt, 4br/3fb, recently remodeled kitchen with living room, dining room, and large basement rec. room, utility room with washer and dryer. Plenty of storage space. Fenced back yard with a stone patio. Short walk to to Walt Whitman HS, Pyles MS and Burning Tree ES. Short drive to beltway, easy access to DC, walking distance to downtown Bethesda, within 10 minutes of Giant, Whole foods, and short bus ride to Bethesda Metro and NIH. Gas heating, AC. Zip code 20817. Available immediately. Pets acceptable with responsible pet owners and security deposit. includes seasonal garden maintenance.